We all love to be pampered. Whether it’s a day at the spa, or a trip to the hair salon, it’s nice to let the professionals take care of the work, and let the day melt away so you can face it feeling more refreshed and beautiful. Knowing what women like, a mother and daughter in Scottsdale teamed up to open Primp and Blow- Scottsdale’s first and premiere blow dry bar. Melodi Harmon, President and founder of Primp and Blow, along with her daughter Cynthia Harmon-Dawson the co-owner have opened three locations with two in Scottsdale, and another in the Phoenix Biltmore area. 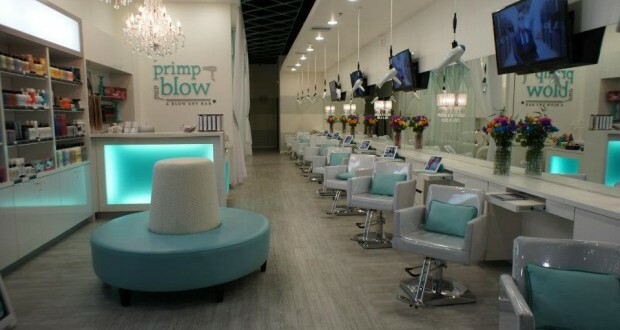 Even though no coloring or cuts are offered at Primp and Blow, they are on the cutting edge of technology. If you’d like to read a magazine while getting your blow out, just pick up the Apple iPad that is sitting at every hair station, and swipe through the screens. Electronic magazines are at your fingertips so you don’t have to run down your phone battery, or shuffle through traditional volumes. The interior colors of Primp are white and teal, so each station is pristine in cleanliness. To cut down on clutter, you’ll notice the blow dryer is suspended above your head. All the blow dryers come down from the ceiling on retractable cords so they are always at your stylists fingertips. Besides blow outs, Primp offers a wide selection of services for your mane. There is the wash, condition, dry, and style. Primp’s stylists can literally make your hair do anything. From soft waves, to straight and shiny, to curls, and updo’s, they know how to do it all. There is a style menu on their website with looks for any occasion or face, including one they came up with on their own. The Scottsdale Ponytail is a high class twist on a traditional tail. Placed high on your crown with gentle curl, and covering the elastic, it can be dressed up or down. Once your hair is gorgeous, you’ll want to make sure your face is too. Head over to the makeup bar, and your same hair stylist will work with you to create any makeup look you desire for either day or night. 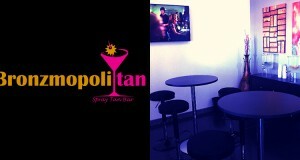 South Seas Tahitian Airbrush tanning is also available at their Scottsdale Waterfront location. So much more than just hair and makeup, Primp and Blow offers some spa services. 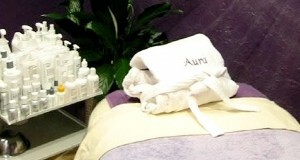 Waxing is available for face, legs, and bikini areas. Eyelash extensions can be done from the natural to the dramatic in partial or full sets. Facials and peels are some of the best you will have as the ingredients used are good enough to eat! No harsh chemicals are used in the hour long facials and peels that leave your skin looking it’s best. In fact, Primp uses only the best products found anywhere, from Bumble and Bumble, and Moroccan Oil hair products to KeratinComplex Express Blow Out Treatment and more. Rain Cosmetics are used for makeup application. This exclusive line of cosmetics started out in Las Vegas, and currently, Primp is the only place in Arizona offering them. The rich, intense colors of Rain are perfect for photo ops like your wedding. Speaking of weddings, Primp and Blow offers special wedding packages perfect for your big day. There is a menu of services for every need from hair to makeup for the bride, bridal party, and mother. The entire salon can be reserved for this occasion, or just a few chairs. If you prefer, you can have your own stylist come to you at your location and work their magic. If wedding bells aren’t in your future, you can still reserve the bar for parties complete with small bites and drinks for you and nine of your closest friends. For the younger girls, there are Princess Diva Parties available for those from ages 4 to 15! Gift cards and memberships are available, and if you’d like to book an appointment, this is easily done on their website: http://www.primpandblow.com/locations.html or right from their Facebook page. As you know, most stylists take Mondays off. Not so at Primp and Blow. They are open all seven days to make sure you look beautiful any day of the week. So book and appointment, pull up a chair, and get ready to look your best! Whether heading to the altar, a night out, or the prom, you’ll wonder how you ever did it without the services of these talented men and women before. Primp and Blow is your place to get the star treatment any time. Subscribers are added to the Scottsdale One Quarterly and our Article Priority Notification. Get article and event updates first, win show tickets, free dinners and other fun giveaways that are offered ONLY to our Subscribers.